The Headland Villa 1 is equipped with all the modern amenities and luxuries that you need for an unforgettable holiday - yet it blends in seamlessly into its picturesque island surroundings. At this hilltop villa, you’re well poised to enjoy unobstructed views out to the sea and neighbouring Five Islands - along with luxuries like immaculate service and ultimate privacy. The villa may be rented in conjunction with the other vacation properties within the Headland Estate. Four guests are accommodated in two bedrooms. 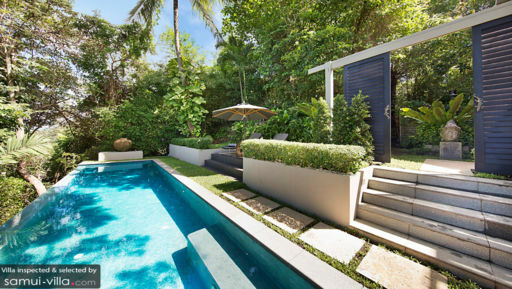 Each offers air conditioned interiors, a private en suite and easy access to the pool and garden. Quality linen, amber lighting and blackout curtains help facilitate uninterrupted sleep. 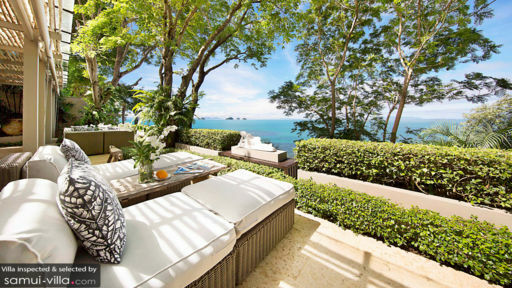 Sink into an infinity pool with uninterrupted views out to the ocean and Five Islands. By the poolside lie a couple of loungers set under the shade of a patio umbrella - the perfect spot to dry off after a swim. Stone pathways lead from the pool area to an outdoor lounge, kitted out with armchairs, a coffee table and reclining Buddha statue. Sliding wooden panels set the outdoor compound apart from the indoor spaces. It’s all about the details at The Headland Villa 1 - from its immaculate upkeep, to door handles that are crafted in the form of geckos to remind you of your tropical surroundings. The décor is elegant and simple, with white and cream hues, wooden furnishings and the occasional ornament that adds a bright pop of colour within. All sides of the lounge can be opened out to create an incredible indoor-outdoor living area. A six seater dining set, island counter and beautifully appointed open kitchen makes the common area ideal for entertaining. Ascend the stairs to access the mezzanine. The space is kept cosy with throw pillows, a sofa set and rug. A flat screen TV provides entertainment, while a writing desk with armchair provides comfortable seating for moments where you need to catch up with work. The Headland Villa 1 enjoys impeccable service, with a villa manager that’ll readily attend t your holiday needs. Daily breakfasts is included with your stay, while services available at additional costs include: extra guests, airport pick-up, vehicle rental, as well as babysitting, driver, private chef and in-villa massage services. You’re just two minutes’ walk from Taling Ngam Beach. The idyllic coast boasts calm, shallow waters and unlike the more popular beaches of the east, remains relatively free of beach vendors. It’s ideal for swimming, sunbathing and relaxed beach strolls accompanied by views out to Ang Thong National Marine Park. Away from the beach are activities like yoga, spa, freshwater fishing and Muay Thai. Join in a group class at Marga Yoga, not forgetting to round out your session with an vegetarian or vegan meal at Soul Food Cafe. Baan Thai Spa at InterContinental Samui throws out a great selection of spa rituals for complete relaxation. Taling Ngam Muay Thai is a great place to work up a sweat, and fishing enthusiasts will enjoy whiling away time at TopCats Freshwater Fishing Resort. Despite its laidback vibes, Taling Ngam isn’t lacking in the dining scene.Jahn Restaurant and The Island View Restaurant are great options for a fine dining experience. We like brunching out at Fai, Hemingway’s on the Beach and Nikki Beach Club. For some of the freshest seafood catches on the island, hop into a car for a 10-minute drive out to Thongkrut Fisherman’s Village. We have been hiring villas for the last ten or so years and i can safely say that this was one of the best ever. The sunsets each night are to die for. The help around the house (cleaning, breakfast, car hire, bike hire etc) is excellent. Lek really was wonderful. The actual house itself is very well finished - it really does feel and look like the photos suggest. Where else can you lie in bed and have a 180 degree view of the sea. There were at least five restaurants within waling distance that were superb - Virgin Coast being our favourite. I would happily recommend Headland Villa 3 to anyone and everyone. Our Honeymoon at The Headland Samui in Feb 2014 was a honeymoon to remember! After booking into another resort in Koh Samui and feeling incredibly let down 'the Headland Villa's' came to the rescue and saved the remaining 5 days of our honeymoon! On arrival we were greeted by the beautiful Khun Lek, the villa's manager in which nothing was too much hassle (she even went that extra mile and went herself to the shops when we ran out of wine or grocery's). Her warm and friendly nature was welcomed throughout our stay and we hope to see her again in the near future. On walking into our villa for the first time we were blown away, what with our own infinity pool and beyond stunning views. We truly felt like we were in paradise and we finally had the honeymoon location we had dreamt of. The villa was clean, spacious and like nothing we had stayed in before. The customer care was what we would rate way above 5 star. The villa was kept clean on a daily basis and we were served breakfast every morning in the comfort of our own villa. One day we decided we needed a massage, so Khun Lek organised 2 massage therapists to come to our villa and give us treatments in the privacy of our own villa, this was perfection (again an example of nothing being too much hassle). The beach below the villa was absolutely stunning and it felt calm and private, a far cry from the beach on the other side of Koh Samui which was busy with holiday makers and tourists. We had a choice of beautiful restaurants close by and were recommended by Khun Lek to visit The Island View restaurant which was by far our best meal during or time getting married and honeymooning in Thailand. We enjoyed it that much that we returned again on our last night at The Headlands. Overall our stay at The Headland Villa's exceeded our expectations and I cannot emphasise how perfect and surreal a place this is! 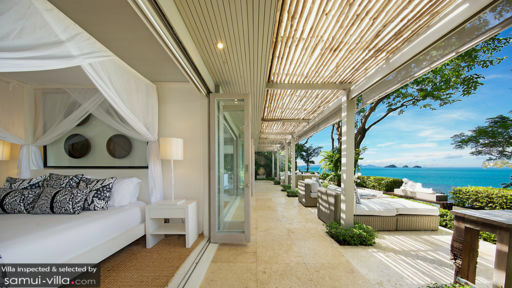 Wether it is a romantic getaway you require or a chilled family retreat, The Headland Villas Samui will not disappoint and I can guarantee we will be back!